Woodcliff Lake, NJ -The BMW M Roadster returns to the stable of BMW M products for the 2006 model year. This time it is based on the newly updated BMW Z4 Roadster. The Z4 Roadster receives a number of enhancements for 2006, not the least of which are the latest Valvetronic, magnesium/aluminum inline six cylinder engines. The Z4 Coupe Concept embodies the classic values of the BMW brand, and serves as the inspiration for the recently-announced Z4 Coupe and M Coupe production versions. BMW's Active Hybrid Drive Concept, along with other examples of BMW's advanced Efficient Dynamics technology will also be shown. The car that so many enthusiasts have been asking for, the 2006 BMW M Roadster makes its world debut at the North American International Auto Show, alongside the 2006 Z4 Roadster. The M Roadster arrives in US showrooms this spring with an MSRP of $51,995 including destination and handling. 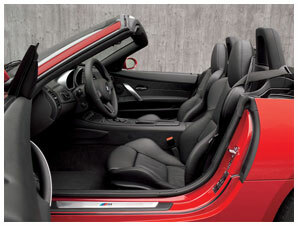 The 2006 Z4 Roadster line-up will consist of the Z4 3.0i at US $36,295 MSRP, and the Z4 3.0si, at an MSRP of US $42,795. At the heart of the new M Roadster is BMW M's award winning 3.2-liter, in-line six cylinder engine. With its high-speed concept, this engine works through a six-speed manual transmission to provide exhilarating performance in all speed ranges. As in the BMW M3, this engine features dual overhead cams, double-VANOS variable valve timing, and six individual throttle plates. This normally aspirated engine generates more than 100 hp per liter. On the road, this means 0 - 60 in less than five seconds and a top speed electronically limited to 155 mph. The M Roadster features the speed-sensitive variable M differential lock, already well-proven and admired in the M3. It provides outstanding stability and traction, particularly when accelerating out of bends. To maximize its braking capabilities, the new M Roadster uses BMW M's floating compound high performance braking system included in the M3 Competition Package. With weight-saving aluminum hubs and steel cross-drilled discs, this system minimizes the risk of warping under hard use.